Letter from the EZLN to Doña Emilia Aurora Sosa Marín, compañera of Honorary Major Insurgent Félix Serdán Nájera. To: Doña Emilia Aurora Sosa Marín. We got the news just a few hours ago. We don’t know how long it will take for these lines to reach you, but we know that regardless of the date, you will be able to read in these words the collective embrace that we send you. 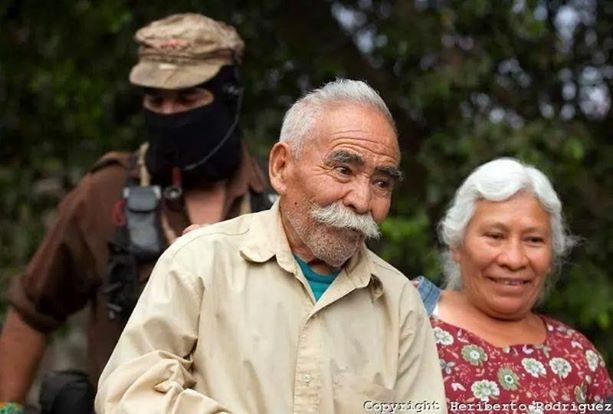 That is because here we also feel the pain and sorrow of the death of Don Félix Serdán Nájera, honorary officer in our Zapatista Army for National Liberation, this past February 22 in the early morning hours. We remember Don Félix’s firm and tender gaze, but we also remember your presence. It is as if between the two of you your journey was complete. That’s why we say that his absence brings us pain, but we also hurt for the pain that you feel in your heart today, Doña Emilia. That is why with these words we not only want to salute the memory of compañero Felix Serdán, but to embrace you as well. You and he have given us a living example that commitment and integrity are not something to boast about, that they are not measured on stages, in spotlights, through grand discourses or fateful dates. Because the struggle is not a conjunctural lightning bolt that illuminates everything and then disappears in an instance. It is a light that, although tiny, is nourished every day at all hours. It does not presume to be unique or omnipotent. Its objective is to join with others, not to light up a monument but to illuminate the path so we don’t get lost. In other words: the struggle doesn’t sell out, doesn’t give in, and doesn’t give up. Don Félix, like you, always spoke and speaks to us in the simple, true words of those who share dreams, pain, and determination. When we listened to him, we heard you both. And it was both of you that we saw and see at our side on the long path of resistance. Because although there are no words to soothe the pain, we have inherited from both of you the commitment to be Zapatistas until our last breath. This example that the two of you have given us, which is repeated and reflected in women, men, and others  in every corner of the planet, demands and obligates us to pursue the two things that we who struggle for justice, liberty, and democracy insist upon: resistance and rebellion. And just as we see you, in your gaze we see ourselves. This is because both of you have been on this side of things regardless of trends or circumstances. You are on this side because you saw that our path here and yours there have the same destiny. Without wasting time and energy on the words and gazes above, the two of you have always kept your heart open to those who are like us: those who have no faith in a system that oppresses us, deceives us, and attacks us; those who, with the same tender rage that one could see in the gaze of Major Insurgent Félix Serdán and in your own, Doña Emilia, construct a thousand mirrors of freedom, without fuss, without useless ceremonies, and without thunderous declarations. 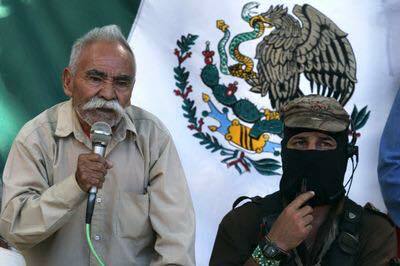 We saw that a flag, the red and black flag of the EZLN, covered the final resting place of our compañero. With our flag, the women, men, children, and elderly of the Zapatista Army for National Liberation were and are present there. With our flag we are with you, Doña Emilia. Your example will live on in all those who cover themselves with this flag. The struggle will continue with them. Because it is true that death finds no relief if our gaze stops at the end. But here we think that death is only cured by life, and that life is only worthwhile if it is lived in struggle. And the struggle is only fertile in collective. So we do not die with Don Félix. With his life we live. With his life and that of many others who died resisting and rebelling. Because even though it might seem like nobody keeps an accounting of those who are now gone, there are some who are no one so that accounting will not be forgotten. We send you an embrace that, although it will not cure the loss, may bring relief in confirming, to you and to Don Félix, that here your gaze is reflected because we walk the same path. 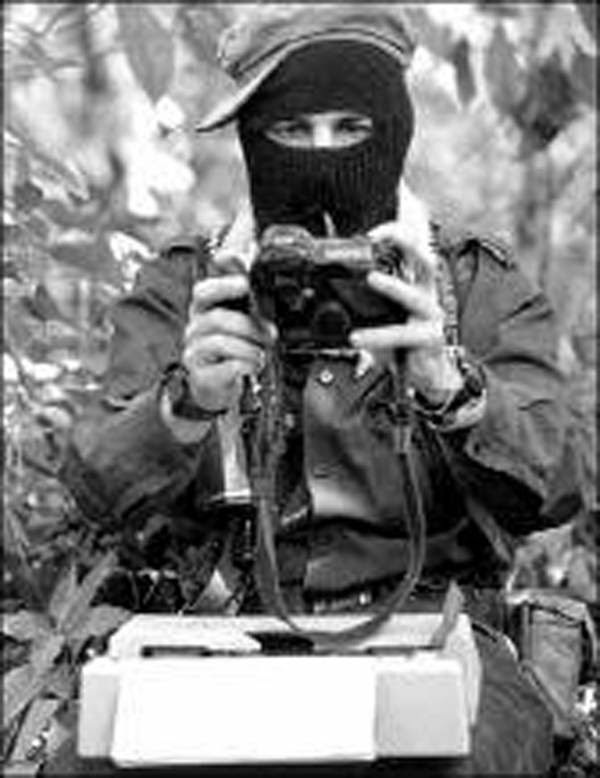 In the name of all of the women, men, children, and elderly of the Zapatista Army for National Liberation. P.S. According to what we are told by the Support Team for the EZLN’s Sixth Commission, you have already received a small contribution that we sent as soon as we learned this sad news. With this letter comes a little more. It is not a lot because our possibilities do not allow for much. But support between compas has no measure. We know well that this does not relieve the pain of loss, but we also know that you have suffered economic hardship due to the long illness of our compañero. We are certain that the compas of the Sixth everywhere in the world, like us, will support you with whatever they can. The text uses “muchos, muchas, muchoas” to give a range of possible gendered pronouns including male, female, transgender and others.